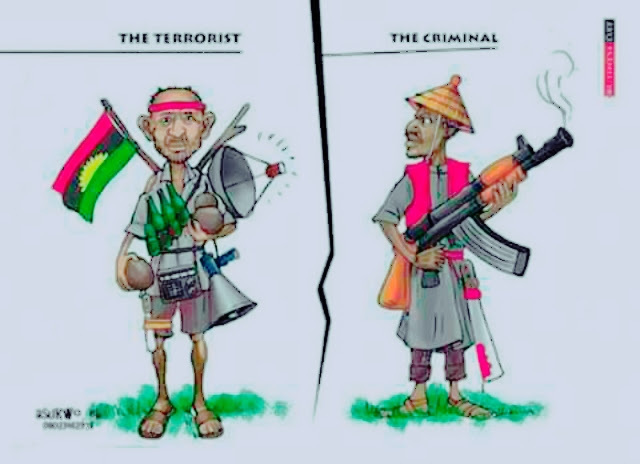 Since the indigenes of Biafra otherwise known as IPOB has been branded terrorists by the Nigerian government, what, therefore, is the essence of voting and for what purpose and who are we casting our votes for? We only terrorized with undiluted truth and they tinted us terrorists having felt the heat that emanates from collective reactions to a failed system and polluted leadership who only displays their unfaithfulness to the masses they pledged to serve and protect. They made us their footsteps, cleaned up their way to power then discarded the very ones they used because they needed power and wealth for themselves. They eat and forgot our groans and pains. They are quick to condemn their very own for promised favours and acquisitions. These crumble eating Eastern governors are nothing but bulldogs which bark constantly at nothing but a show of cowardice. Now election period is here again and like Judas Iscariot, they sold out and refused to adhere to the yearnings of the people. They say they are preventing the Federal government from declaring a state of emergency in their respective states, but how come? Were they under any form of attack? Were their homes and offices bombed? Was any member of their family kidnapped or killed? Upon emergency, President Buhari dismantled roadblocks in the northern Nigeria, moved the entire armoury, according to him, to safety in Maiduguri and reopened her airport. He even sponsored dialogues with the dreaded terror group, Boko Haram and defended Fulani herdsmen killings, yet the compromised Eastern governors chose to be mute when we were invaded and killed. They go for solidarity visits in Abuja when their people are murdered in their homes in a broad daylight by marauding herdsmen. But today, they need us badly. The crave for our votes; they blame Nnamdi Kanu for standing up to the challenge. They support the invasion of his home and privacy. They insult the intelligence of Biafra by conniving in the deployment of soldiers to invade, intimidate, humiliate, molest and massacre us in our land, yet they want to remain in power through our votes. They must have taken us for fools who do not ponder and query their actions and inactions. Will Biafrans be so foolish to forget these past insults and assaults hauled on us as an entity? Have we overcome the nightmares of watching horrific pictures and videos of our brethren soaked in mud water, drinking to death or been shot to death? How about those whose backs peeled from whips from military stripes? These fake governors applauded the wickedness meted out on the poor civilians and never mentioned a single word of sympathy or in condemnation to the slain by these invading villains they invited into our midst. Who would after all their stupidity and selfishness, dare to stand under the sun and rain, queuing to vote these hypocrites and increased our penury and suppression again? Who would dare to accept their blood money and sell their birthright like Esau, who paid dearly for it? Even Judas returned the one pound, ten shillings he obtained for selling out the Messiah, but it was already too late for him. I hope our people will note that on 18th November 2017, we shall be sitting in our homes recounting our losses and refocusing on our future prospects. I hope, we will not forget to mourn and pray for the souls of our slain brethren. I also hope we would not forget that as terrorists of truth, our truth must prevail. Therefore, terrorists do not vote, they terrorize! Terrorists do not move openly in public place, they remain in their hideouts. Terrorists make statements by action, so let our actions speak as we maintain our irrevocable stance on Biafra agitation. We must terrorize by speaking the truth and by acts of absolute compliance to NO ELECTION MOVE in Biafra land. We owe it to our leader, Mazi Nnamdi Kanu who has given his all and never failed us yet. We owe it to our people who have paid dearly with their precious lives or maimed, and those languishing in various prison facilities. We owe it to our children and posterity in our lineage. Finally, we owe it to ourselves as we are opportune to be alive and end the injustices meted out on us as a people. Say NO to ELECTION in Biafra until a referendum is ascertained. All hail BIAFRA!